Thales remains one of the most distinguished of all figures in the history of mathematics. He is considered the true father of Greek math, science, and even philosophy. Considering the impact of Greek innovations in these disciplines, Thales may actually be considered the father of these disciplines for Greece and for the world in general. 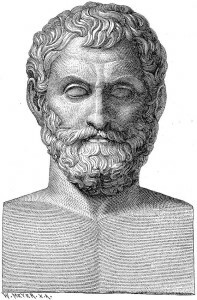 Thales was born around 624 BC. Due to the loss of records, there is very little known about him. It is known, however, that Thales had traveled early in life to Egypt and Babylon. During this tenure, he learned a great deal about astronomy and geometry. From his experiences, he was able to craft his own discoveries. One of those discoveries was deductive mathematics which helped shaped theories of logic and math. He would soon develop the revolutionary concept called Thales Theorem which noted there are three points in a circle: A, B, and C. The diameter would be the line between points A and C.
There were several other innovative theorems that Thales would be credited with discovering. While they are not thought about as anything staggering by today’s advanced mathematics, Thales’ early research would make many simple deductions that would influence the evolution of math immensely. Attributed to Thales would be the notion a circle can be bisected by its diameter and that in an isosceles triangle, the base angles are equal. His work was not always great though. He did have the dubious distinction of noting the earth was disk shaped and not round and they it floating on an ocean. The ocean, incidentally, was infinite. This notion was, obviously, disproved at a later point in human history. The time it took to disprove it was well over a thousand years after Thales noted his theory. While known mostly as a mathematician, Thales was also a philosopher in his own right. He championed scientific inquiry. He tried to avoid looking at mythology for answers to the origins of the natural world. He looked into the reasons for humanity’s existence and tried to do so without seeking answers in Zeus or the other gods of antiquity. Within his philosophical musings, he was the first to truly flesh out the notion of examining things from the perspective of general principles and more rational, tight-knit hypotheses. Such innovative concepts had a profound impact on the sciences. As a result of his work, some have called him the ”Father of Science,” although this title might be a bit of an overstatement.